Behavior of implants can be significantly modified by surface covering technologies in the aim of diminishing erosion, corrosion, and frictioning; providing more esthetical visual; developing optical, thermal, and electrical features; and obtaining biocompatibility and antibacterial effect. Implant surface operations are often performed subsequent to the covering procedure of titanium and titanium alloys. This kind of operations can also be carried out by laser metal sintering. This method is based on high-power laser beam conjoining an implant stem designed electronically with the aid of a computer program with the metal dust bed as thin layers. As the last layer agglomerates, the surface becomes rough., Thus, this method may be considered as a surface-covering technique to increase implant–bone contact. Laser metal sintering method can be divided into two subgroups. Selective laser sintering (SLS) technology partially melts metal particles, whereas selective laser melting (SLM) method melts all of them., Therefore, SLM provides less porous structure than SLS. Morphological modifications on biomaterials have an impact on the response of cell to the implant. Previous studies demonstrated that implant surface properties play a substantial role on recovery of bones and gingivial tissues. In the present study, proliferation of human gingivial fibroblast (HGF-1) cells on a rough implant surface obtained by covering Grade 5 titanium material surface, titanium–6-aluminum–4-vanadium (Ti–6Al–4V) alloy and by Grade 23 Extra low interstitial (ELI) titanium alloy using SLM technology was investigated. In order to compare the results, cell adhesion and proliferation on covered surfaces; surfaces treated with sand-blasted, large-grid, acid-etching (SLA) technique; and both SLA and SLM techniques were also evaluated. The main aim was to provide a novel surface procedure providing more biocompatible external structure with a biomechanically intact inner structure and increasing cell proliferation. In order to prepare the samples for further investigation, a titanium stick with 5 mm of diameter was processed with the speed of 10,000 cycle/min on computer numerical controlled and 48 pieces of disks were obtained with 2 mm of thickness. The disks were separated into four groups. First group was chosen to be the control group and was not subjected to any surface treatment. SLA procedure was performed in Group 2 according to American Society for Testing and Materials (ASTM). Finally, Groups 3 and 4 were covered by SLM method and additionally, SLA procedure was performed in Group 4. All disks were sterilized by pressured stream cleaning device (Gazella Golddental Stream Cleaning Robot 2035, Silter, Turkey). SLA procedure was carried out in Group 2, which includes machined disks, and Group 4, which contains the disks treated with SLM. First of all, disks were sanded utilizing Al2O3 particles with 30-μm magnitude with 6-bar pressure for 20 s and washed by ultrasonic cleaning device (Wattson Cleaning Systems, Turkey). Subsequently, disks were rinsed with absolute acetone, 96% ethanol (Merck, USA), and distilled water at 80°C for 15 min each. Later, acidification process was handled with 48% of H2 SO4 (Merck, USA) at 80°C for 20 min and 18% of HCl (Merck, USA) at 80°C for 20 min. Following neutralization by 27% of NaHCO3 (Merck, USA) for 10 min and washing five times with distilled water for 10 min, acidification process was continued by 8% of HNO3 (Merck, USA) of 80°C for 20 min. Finally, after neutralization took place by 27% of NaHCO3 for 10 min, disks were rinsed five times with distilled water for 10 min. For SLM procedure, rustproof steel tray was equipped according to the original size of the laser melting device (LaserCUSING ®, Concept Laser, Hofmann Innovation Group, Germany) in the purpose of applying on both Groups 3 and 4. Wells with 5-mm diameter and 2-mm thickness were constructed on the tray and samples were embedded inside the wells. Surfaces of the samples were covered by Grade 23 titanium alloy with 60 μm of thickness by applying 7 m/h scanning and 2–20 cm 3/h production speed. After the sinterization, samples were incubated in distilled water at 25°C for 5 min, washed with NaOH (20 g/L) (Merck, USA) and H2O2 (20 g/L) (Merck, USA) at 80°C for 30 min, and finally incubated in distilled water for 5 min with the aim of removing the surface remains. Following the construction of disks with appropriate applications, surface roughness of the disks was determined utilizing Mahr profilometer device (Mahr GmbH, Göttingen, Germany) by measuring Ra values. In order to eliminate possible debris on surface, disks were washed with 96% of ethanol for 10 min inside an ultrasonic bath. Measurement length was accepted to be 1.7 mm. Measurement transaction of Ra values was carried out to be triplicate. Disks were covered by gold–palladium mixture of 100-Š thickness using coverage device (BIO-RAD, England) after they were taped onto the metal tray. Following the incubation inside the desiccator for 24 h, one disk of each group was photographed with scanning electron microscope (SEM) (Jeol SEM-ASID 10, Japan) for the purpose of investigating surface morphology. Contact angle measurement was performed using the static drop method to measure the hydrophilic property of materials. For this purpose, optical tensiometer (Attension Theta, USA) was used. Measurements were made for 5 s with at least five drops using one sample from each group. The device makes 30 records in 5 s and calculates the average value of the measurements. This result gives the value of theta (θ) which is an indicator of free surface energy. For further assays involving cell proliferation and cell labeling on the aforementioned disk samples, HGF-1 cell line was purchased from ATCC (CRL46 2014, USA). The cells were cultured in Dulbecco's Modified Eagle Medium (DMEM) supplemented with 10% heat-inactivated fetal bovine serum (HI-FBS), 1% l-glutamine, and 1% penicillin/streptomycin all obtained from GIBCO, UK. Cells were grown in a 5% CO2 incubator at 37°C (Sanyo MCO-18 CO2 Incubator, Japan). Proliferation rate of HGF-1 cells on disks was examined by MTT (3-(4,5-dimethylthiazol-2-yl)-2,5-diphenyltetrazolium bromide) assay protocol adapted from Wu et al. The cells were seeded in 96-well plates (27,000 cell/well) with DMEM-containing HI-FBS onto titanium disks. Cells were incubated in the incubator for 48 h. At the end of the predetermined time of the incubation, the media was replaced with serum-free DMEM and MTT (5 mg/ml) (Sigma, Germany) was added. Four hours later, MTT solvent containing 23% sodium dodecyl sulfate and 45% dimethylformamide was added and cells were incubated for an additional 1 h to allow formazan crystals to solubilize. Absorbance was measured at 590 nm with the aid of PowerWave XS Microplate Spectrophotometer (BioTek, USA). The assay was performed to be n = 8, and the percentage of mean values of absorbance compared to control was assessed to determine the viability rate relatively. Highly lipophilic carbocyanine Dil dye (Vybrant Multicolor Cell-Labeling Kit, Thermo Fischer Scientific, USA) was employed using manufacturer's orders for the purpose of fluorescent visualization of the cells proliferated on the disks. Dive microliters of Dil dye was added to HGF-1 cell suspension and cells were incubated inside the incubator for 45 min. Once the incubation period came to an end, cells were planted into 6-well plates (30,000 cell/well) on different groups of titanium disks and incubated inside the incubator. After 48 h, cells were visualized with the aid of fluorescence microscope (Zeiss Examiner A1, USA). GraphPad Prism Version 5.03 software was employed for statistical evaluation of all obtained data. Mann–Whitney U test was chosen to determine the significance between the control and sample data of MTT assay and surface roughness. All P values were based on the two-sided statistical analysis and P < 0.05 was considered to be statistically significant. 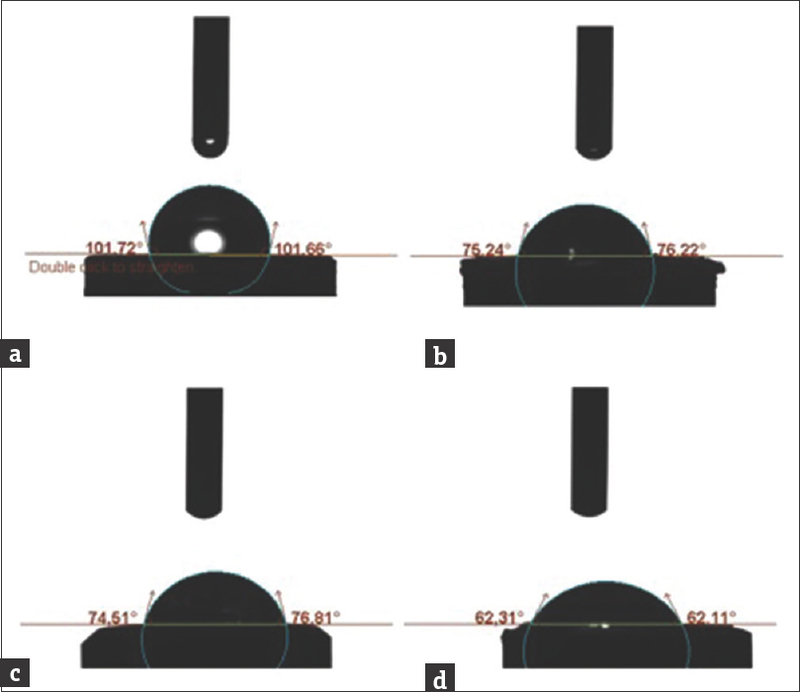 When surface roughness of the disks was examined, average Ra values of Groups 3 and 4, which were treated with SLM process, were 2.308 and 3.467 μm, respectively. These values were observed to be higher than the values of control group which was not treated with either SLA or SLM (Ra = 0.592 μm) and Group 2 which was only handled with SLA procedure (Ra = 1.783 μm). The difference of the Ra values of Groups 2–4 compared to control was shown to be statistically significant (P < 0.05) [Table 1]. Morphologies of the surfaces were investigated with the aid of SEM prior to the planting of HGF-1 cells on the surface. 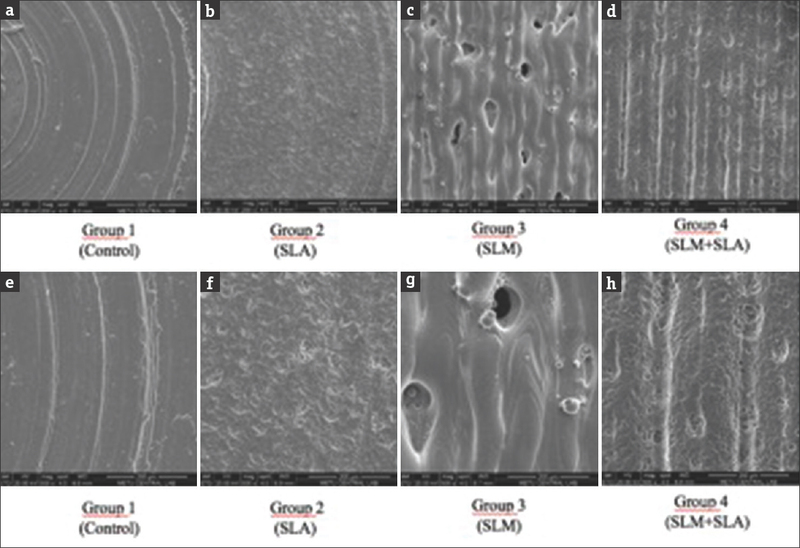 The surface of the control group was only machined, and according to the obtained images, surface was almost smooth [Figure 1]a and [Figure 1]e. SLA procedure was applied to Group 2 and SEM images revealed irregular and highly rough characteristic feature on the disk [Figure 1]b and [Figure 1]f. SEM results of Group 3 displayed an even and rather regular morphology, which renders an optimal microenvironment for the cells to grow. The bulges on the surface were considered to be the oxide layer as a result of thermal evaporation caused by melting procedure [Figure 1]c and [Figure 1]g. Surface morphology of Group 4, treated with both SLM and SLA, was similar to the morphology of the disks in Group 2. On the other hand, the surface was seem to be irregular and more disorganized [Figure 1]d and [Figure 1]h.
When the hydrophilic property of the disks was evaluated, contact angle value (θ) was the highest for the control group (101.72°), which hinders a highly hydrophobic property to the surface. The results showed that this value was found 74.51° for Group 2 and 75.24° for Group 3. The lowest value was measured as 62.31° in Group 4 [Figure 2]a, [Figure 2]b, [Figure 2]c, [Figure 2]d, being the most hydrophilic sample. MTT proliferation assay was carried out for each group at 48 h with the aim of examining the impact of the surface morphology of the titanium disks on HGF-1 cell adhesion and proliferation. MTT results of 48 h demonstrated a significant elevation of cell viability on all of the groups compared to the control group (P < 0.05) [Figure 3]. Lastly, HGF-1 cells were incubated with Dil dye in order to interpret cell proliferation qualitatively on the disks. Data showed that after 48 h of incubation, HGF-1 proliferation was lower on control group and Group 4 when compared to the Groups 2 and 3. The highest cell density was observed in Group 3, whereas in control group, cell density was the lowest [Figure 3]. These results were to be consistent with MTT proliferation assay. Grade 5 (Ti–6Al–4V) is the most preferred titanium alloy in dental implantology, whereas Grade 23 is a different form that contains lower oxygen, nitrogen, and iron. Grade 23 displays better biocompatibility and is more flexible, although its endurance is known to be less. In the present study, Grade 5 titanium disks covered by Grade 23 were employed in order to create a better cell contact surface with a resistant inner structure. In a recent study, the effect of properties of an implant surface and roughness on HGF-1 cell proliferation was examined. Values of the extracellular matrix components as collagen and fibronectin were higher on the implants with rough surface rather than the implants which were machined or had a smooth surface. This led to the conclusion that cell proliferation on rough surfaces was in higher rate. These results were consistent with the present study demonstrating that HGF-1 proliferation rate was relatively lower on the disks with machined surface. In various studies, roughness of machined surfaces and the surfaces treated with different procedures were investigated to determine whether there is any histological correlation. Abrahamsson et al. found Ra values of machined surfaces and surfaces sanded and treated with acid to be 0.35 and 2.29 μm, respectively. Another study focused on osteoblastic activity on the surfaces which were machined or treated with sand and acid measured Ra values of machined surfaces to be 0.56 μm. This study delivered average Ra value of machined titanium surfaces to be 0.59 μm in correlation with prior studies. SLA surface is a modified titanium implant surface which has been launched by a company named Straumann. SLA surface was compared to the other implant surfaces regarding histological and morphological properties and Ra value of the SLA surface was determined to be approximately 2 μm., In the present study, average Ra value of Group 2 consisting titanium disks treated with SLA procedure was measured to be 1.78 μm which is higher than the average Ra values of both machined surfaces and the surfaces treated only with acid. Although there are not many research studies on topographic evaluation of surfaces of titanium materials produced with SLM technique, a study conducted by Chen et al. claimed the Ra value of the surfaces of the implants treated with SLM to be 4.7 μm. In the present study, this value was obtained to be 2.3 μm, whereas Ra value of the Group 4 treated with both SLA and SLM was measured to be higher as expected (3.4 μm). Bulges present both in control group and Group 3 are thought to be the image of metal oxide caused by the covering and sintering procedures. Lack of bulges in Group 2 indicates that sanding procedure and treatment with acid eliminate metal oxide layer. In this study, proliferation of HGF-1 cells on modified titanium surfaces was analyzed by MTT assay and fluorescent-imaging techniques. MTT assay was carried out on 48 h. When cell viability was accepted to be 100% in the control group, cell proliferation rates were shifted to 126.9%, 127.9%, and 111.1% for Groups 2, 3, and 4, respectively, on 48 h, and the differences between control group and the other groups were proved to be statistically significant. When these findings were taken together, it was clear that cells were more consistent and showed higher cell viability rate on SLM surfaces. Group 2 which was previously treated with SLA procedure also provided a convenient surface regarding cell adhesion and cell proliferation consistency. In a study focused on dental implant surface technologies, optimal roughness value was defined to be 1.5–2 μm, and it was concluded that lower or higher values of roughness effect cell proliferation negatively. In this study, the decrease in cell proliferation in Group 4 may be attributed to a higher Ra value. For the purpose of scanning the behavior of the cells on modified titanium surfaces qualitatively, fluorescence microscope was employed. Highly lipophilic carbocyanine Dil was used to dye the cells which gives more reliable results than other cationic dyes and agents that intercalate. Additionally, Dil dye prevents nonspecific background staining by dyeing only alive and proliferating cells, which can be a major problem with other dyes. Results obtained on 48 h were in correlation with the MTT results showing higher cell proliferation in Groups 2 and 3. The most common procedure to get an idea of the wetting behavior of a solid material is the static drop method. This method was also used in this study. In this method, the liquid, usually selected as water, is left on the solid surface for a while and the tangent of the angle formed between the liquid and the solid surface is calculated. Furthermore, the horizontal distance of the liquid formed on the solid surface is determined, and this angle is calculated as the contact angle (θ). θ is a quantitative measure of surface wettability. The surface is hydrophilic if the θ is less than 90°, hydrophobic if it is greater than 90°. In control group, θ is found 101.72°, showing a very hydrophobic characteristic of the surface, which leads in poor viability of the HGF-1 cells, which is confirmed by MTT assay. The result can also be visualized in fluorescent-imaging experiment. The contact angle of the other groups is smaller than 90°, giving a hydrophilic property to the disks. Similarly, in a study conducted by Algangrin et al., the contact angle at SLM surfaces was found to be less than 90°. Hydrophilic surfaces provide a convenient interface for attachment and proliferation of biological materials. Thus, it is expected that the more hydrophilic the implant surface, the more it will contribute to wound healing and osseointegration. In our study, the most hydrophilic surface was found to be Group 4. However, it was observed that cell viability was decreased by nearly 15%, compared to Group 3. The second most hydrophilic surface is observed in Group 3, which reflected the highest viability among other groups. Our viability results were totally consistent and were confirmed with fluorescent imaging. Although surface roughness and surface wettability are separately very important features for the cells to adhere, when combined, they exerted decreased viability on healthy cell proliferation. Taken altogether, these data suggest that surface morphology in combination with wettability and roughness characteristics are very critical parameters on biological microenvironments. In the present study, cell adhesion and proliferation were examined on the titanium implant disks treated with SLA, SLM, and both SLM and SLA compared to the machined control group. It was clear that the surface morphology, roughness, and surface wettability are among the most important factors on cell proliferation. Cell viability rate was the lowest on the control group, consistent with most previous histological studies focusing on titanium implants. The most hydrophilic surface was detected in Group 4, with slightly decreased cell viability. Group 3 having a hydrophilic surface close to Group 4, an optimal Ra value, an evenly distributed and organized topography, has the highest cell viability rate. These data were consistent and were confirmed fluorescent microscopy imaging. Therefore, it is strongly believed that lowering the Ra value to 1.5–2-μm interval will have a positive effect on biocompatibility. Lekholm U, Grondahl K, Jemt T. Outcome of oral implant treatment in partially edentulous jaws followed 20 years in clinical function. Clin Implant Dent Relat Res 2006;8:178-86. Ueno H, Mori T, Fujinaga T. Topical formulations and wound healing applications of chitosan. Adv Drug Deliv Rev 2001;52:105-15. Ikinci G, Senel S, Akincibay H, Kas S, Ercis S, Wilson CG, et al. Effect of chitosan on a periodontal pathogen Porphyromonas gingivalis. Int J Pharm 2002;235:121-7. Jemt T. Single implants in the anterior maxilla after 15 years of follow-up: Comparison with central implants in the edentulous maxilla. Int J Prosthodont 2008;21:400-8. Elsaka SE. Effect of surface pretreatments on the bonding strength and durability of self-adhesive resin cements to machined titanium. J Prosthet Dent 2013;109:113-20. Thomas KA, Kay JF, Cook SD, Jarcho M. The effect of surface macrotexture and hydroxylapatite coating on the mechanical strengths and histologic profiles of titanium implant materials. J Biomed Mater Res 1987;21:1395-414. Johansson CB, Han CH, Wennerberg A, Albrektsson T. A quantitative comparison of machined commercially pure titanium and titanium-aluminum-vanadium implants in rabbit bone. Int J Oral Maxillofac Implants 1998;13:315-21. Carlsson L, Rostlund T, Albrektsson B, Albrektsson T. Removal torques for polished and rough titanium implants. Int J Oral Maxillofac Implants 1988;3:21-4. Albrektsson T, Wennerberg A. Oral implant surfaces: Part 1--review focusing on topographic and chemical properties of different surfaces and in vivo responses to them. Int J Prosthodont 2004;17:536-43. Wennerberg A, Albrektsson T. On implant surfaces: A review of current knowledge and opinions. Int J Oral Maxillofac Implants 2010;25:63-74. Witek L, Marin C, Granato R, Bonfante EA, Campos F, Bisinotto J, et al. Characterization and in vivo evaluation of laser sintered dental endosseous implants in dogs. J Biomed Mater Res B Appl Biomater 2012;100:1566-73. Jaffin RA, Berman CL. The excessive loss of Branemark fixtures in type IV bone: A 5-year analysis. J Periodontol 1991;62:2-4. Chien CC, Liu KT, Duh JG, Chang KW, Chung KH. Effect of nitride film coatings on cell compatibility. Dent Mater 2008;24:986-93. Mangano C, Piattelli A, Raspanti M, Mangano F, Cassoni A, Iezzi G, et al. Scanning electron microscopy (SEM) and X-ray dispersive spectrometry evaluation of direct laser metal sintering surface and human bone interface: A case series. Lasers Med Sci 2011;26:133-8. Lopez-Heredia MA, Sohier J, Gaillard C, Quillard S, Dorget M, Layrolle P. Rapid prototyped porous titanium coated with calcium phosphate as a scaffold for bone tissue engineering. Biomaterials 2008;29:2608-15. Chen J, Zhang Z, Chen X, Zhang C, Zhang G, Xu Z. Design and manufacture of customized dental implants by using reverse engineering and selective laser melting technology. J Prosthet Dent 2014;112:1088-95.e1. Mustafa K, Wroblewski J, Hultenby K, Lopez BS, Arvidson K. Effects of titanium surfaces blasted with TiO2 particles on the initial attachment of cells derived from human mandibular bone. A scanning electron microscopic and histomorphometric analysis. Clin Oral Implants Res 2000;11:116-28. Wu GS, Lu JJ, Guo JJ, Huang MQ, Gan L, Chen XP, et al. Synergistic anti-cancer activity of the combination of dihydroartemisinin and doxorubicin in breast cancer cells. Pharmacol Rep 2013;65:453-9. Ramaglia L, Capece G, Di Spigna G, Bruno MP, Buonocore N, Postiglione L. Effects of titanium surface topography on morphology and in vitro activity of human gingival fibroblasts. Minerva Stomatol 2013;62:267-80. Abrahamsson I, Berglundh T, Linder E, Lang NP, Lindhe J. Early bone formation adjacent to rough and turned endosseous implant surfaces. An experimental study in the dog. Clin Oral Implants Res 2004;15:381-92. Piattelli M, Scarano A, Paolantonio M, Iezzi G, Petrone G, Piattelli A. Bone response to machined and resorbable blast material titanium implants: An experimental study in rabbits. J Oral Implantol 2002;28:2-8. Buser D, Nydegger T, Hirt HP, Cochran DL, Nolte LP. Removal torque values of titanium implants in the maxilla of miniature pigs. Int J Oral Maxillofac Implants 1998;13:611-9. Buser D, Schenk RK, Steinemann S, Fiorellini JP, Fox CH, Stich H. Influence of surface characteristics on bone integration of titanium implants. A histomorphometric study in miniature pigs. J Biomed Mater Res 1991;25:889-902. Mendonca G, Mendonca DB, Aragao FJ, Cooper LF. Advancing dental implant surface technology--from micron- to nanotopography. Biomaterials 2008;29:3822-35. Rupp F, Gittens RA, Scheideler L, Marmur A, Boyan BD, Schwartz Z, et al. A review on the wettability of dental implant surfaces 1: Theoretical and experimental aspects. Acta Biomaterialia 2014;10:2894-906.